Allan Haschick explains the best way to apply soluble and granular fertilisers to your garden. Today it is easy to work out which fertilisers to use for which plants simply by reading the container or bag. Most fertiliser companies describe what the fertiliser is best used for on the container, or you can make your own assessment by looking at the fertiliser ratio (see the 'Ratio rhyme' box). Most fertiliser bags or containers also provide instructions on how best to apply the fertiliser. Below is some helpful information about how to apply soluble and granular fertilisers. These are concentrated fertilisers that are first mixed or dissolved in water before being applied to the plants. In their diluted state, there is little chance that they will burn the plant, making them ideal for soft, sensitive or young plants. Most indoor plant food, specialised food for seedlings, bonsai and orchids are water soluble. Soluble fertiliser is easy to apply - simply mix the required amount into a watering can or bucket filled with water. Water the plant well with the mixture. 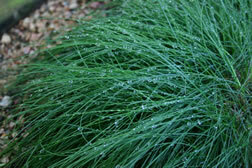 Remember that the fertiliser will be more easily absorbed if the soil is on the moist side. Some soluble fertilisers can even be used as a foliar spray (where the fertiliser is absorbed through the leaves). 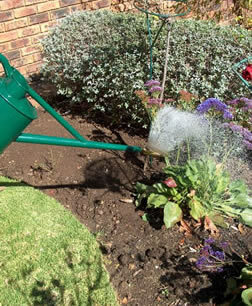 Pour the fertiliser and water mix into a spray bottle and apply to the leaves. Only foliar feed if the instructions on the container indicate you can do so, and use the recommended rate. These are fertilisers that are used dry and sprinkled on the soil around the plant. They are often mixed with a carrier, such as talc or lime, so they can be spread around more evenly. 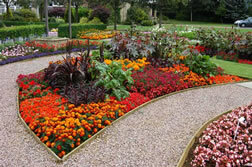 These fertilisers should be watered in immediately to prevent them burning the plants. Granular fertiliser is more complicated to apply correctly. Most gardeners generally sprinkle a handful or so around each plant, hoping that it will be sufficient. This often leads to burning the plant by overfeeding, or not applying enough fertiliser for the size of the plant. Let's say the required amount of fertiliser is 60g per m². Take the plastic cap of an empty aerosol spray, such as a deodorant cap, place it on a small kitchen scale and add fertiliser until it weighs 60 grams. Shake the cap to level the fertiliser and mark the level with a felt tip pen. Empty the fertiliser back into its container. Take a strong pair of scissors and cut along the marked line. You now have a measuring cup for exactly 60g of the required fertiliser. Write on the cup the name of the fertiliser and the gram measurement for next time. Each type of fertiliser has its own dose rate and weight, and will need its own measuring cup. Now when it comes to applying the fertiliser, you can gauge an approximate square metre by pacing or by cutting cut a thin bamboo stake to 1m in length. Sprinkle your full measuring cup evenly over this area. Remember to sprinkle over the whole drip line of large trees and shrubs, even if it is over the grass. The roots of plants grow away from the trunk and the fine feeding roots are those furthest away. 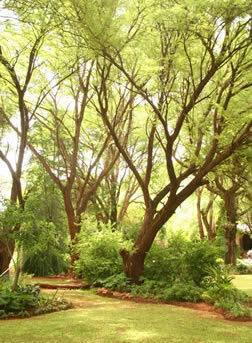 Heavy handfuls of fertiliser near the base of trees and shrubs can cause burning or root damage. Using a measuring cup and a 1m bamboo stake is one of the best methods of evenly applying lawn fertiliser too.